I have wanted to have an easy to use meter for measuring small SMD component. I first tried to fill my need with CEM SMD-100 Smart Electronic Components Tester few months ago, but that CEM SMD-100 meter did not work for me because it was very unreliable. To fill the need, I decided to test HoldPeak HP-990A/B/C Digital Multimeter SMD Tester Resistance Capacitance Meters Diode Test Professional SMT Component Tester – HP-990A product. HoldPeak HP-990A is a handheld and battery operated tweezer style multi-meter designed to conveniently measure SMD (Surface Mounting Device) electronics components. This meter can measure resistor, Capacitor, Diode, Zener and LED. In addition to component measurements HP-990A can measure low DC voltages. The meter brand HoldPeak is owned by Zhuhai JiDa Huapu instrument Co.,Ltd. ● 2999 count LCD display. Auto scanning the Resistance/Capacitance/ Dilde. ●Specialized SMD TEST or TEST DIP Component with leades. The meter has one switch and two buttons. The FUNC button is used as power on/off switch with long presses (works when switch is in R/C/D position). Short presses with FUNC can change the measurement function. The HOLD button can be used for holding measuring value. The switch can select between RCD measurement, diode test and DC voltage measurement. When the switch is in R/C/D position, the meter works in auto scanning function to distinguish resistance, capacitance, diode and continuity, and then enter the corresponding mode to show result. The FUNC button can be used to select between different manual operation modes. The measurement results seem to be pretty accurate as manufacturer promises. When the switch is in the center position this meter can measure Zener diodes, LEDs and series connected LEDs. This mode the meter feeds a current limited voltage to the measurement tip and shows the voltage between pins. If you connect a Zener diode, you get the Zener voltage value. If you connect LED or series of LEDs, you get the voltage drop over them and they put out some light. The meter data tells that the test voltage is approx 20V DC and test current is around 1 mA. On m tests it seems that the open circuit voltage is around 22V and the maximum current to short circuit is around 7 mA. The test voltage + is connected to the upper measurement pin. This worked well. When the switch is in DC 36V position, the meter measures DC voltage between the measurement pins. 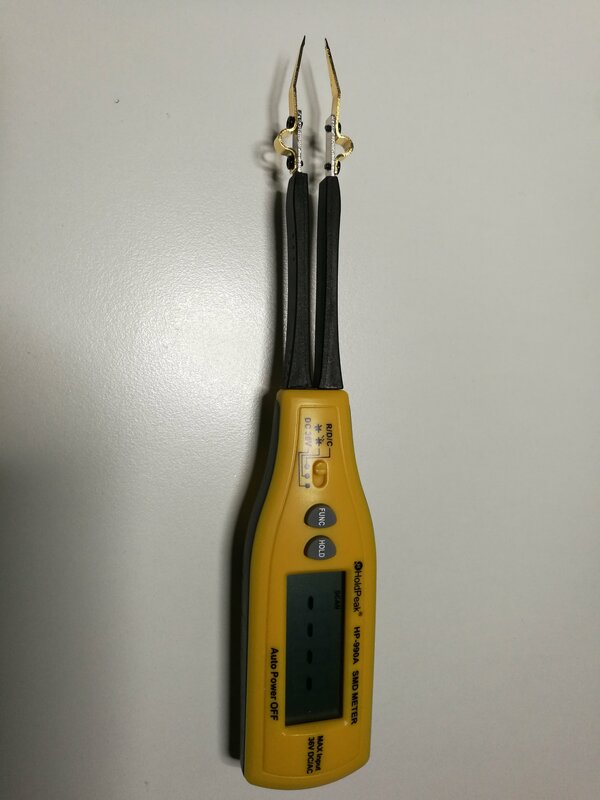 The meter is designed so that you can plug normal 4 mm banana test cables to the holes of the probe, if you want to use this device as bench-top multi-meter. The meter came with two suitable measurement cables. The meter is powered with two 1.5V AAA batteries. I think that Holdpeak HP-990A is a well working tweezer style tester for measuring SMD components. I think it is a addition to hobbyist’s or electronics engineer’s tool arsenal. It does not replace traditional multi-meter, but shines when you need to test SMD components. It is not perfect, but I’m happy with this considering it is prices in the $20-30 price range. You can order the HP-990A meter from Banggood. When ordering please be careful to select the right model you want, because the order page lists three versions A, B and C with somewhat different features.